Professor Cees van der Vleuten is the Scientific Director of the Graduate School of Health Professions Education. The Maastricht School of Health Professions Education (SHE) is a graduate school for education, research and innovation in health professions education. SHE provides high quality multidisciplinary research and teaching aimed at the improvement of health professions education. SHE helps you to innovate education programmes. The school offers a wide range of courses in health professions education, from short courses, certificate courses to degree programmes such as a Master of Science and PhD programme. SHE Collaborates, the office for international collaboration in health professions education within SHE, offers a tailored approach to innovative training and consulting in the areas of education, management and research around the globe. Maastricht University has more than 40 years of experience implementing student-centered learning in medicine and the health sciences. The reputation and expertise SHE has in health professions education and educational innovation, as well as a strong belief in lifelong learning, guarantees a broad range of quality, student-centered programmes to become part of. For teachers, educators, mentors, lecturers, managers, curriculum developers, decision-makers and all other interested in studying or doing research at our renowned graduate school for education, training and research in health professions education. 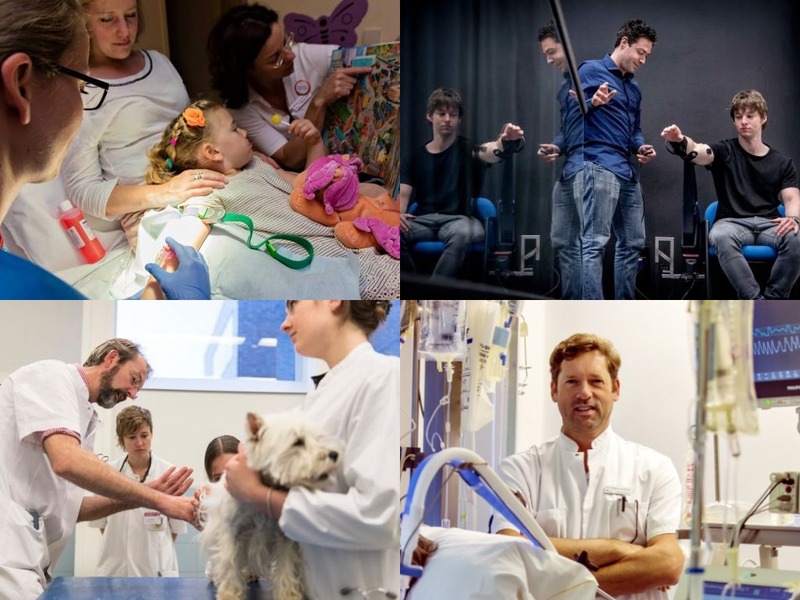 Engagement in training the future generation of health professionals is performed in many fields and executed by clinicians, nurses, health scientists, physiotherapists, dentists, pharmacists, dieticians, veterinarians and speech therapists. Our courses are designed to innovate health professions education in various educational and training fields of health professions. SHE is distinctive in its state of the art reserach and its research informed education offer reflected by the inter-professional and International mix of participants in our courses. For junior health professionals: the best way to prepare for a combined career of clinical work and education. For those with some teaching experience: the way to prepare for a management position in health professions education. Moreover, for experienced health professions educators: the opportunity to have more impact on educational practice with a background in theory and research and a large, international network in health professions education and research. SHE stands for excellent and innovative research and offers a stimulating environment to perform to the best of your abilities. Excellent researchers will guide and supervise you. The PhD research programme requires expertise in the area of medical education or health professions education and a theoretical basis comparable with a Master in Health Professions Education. 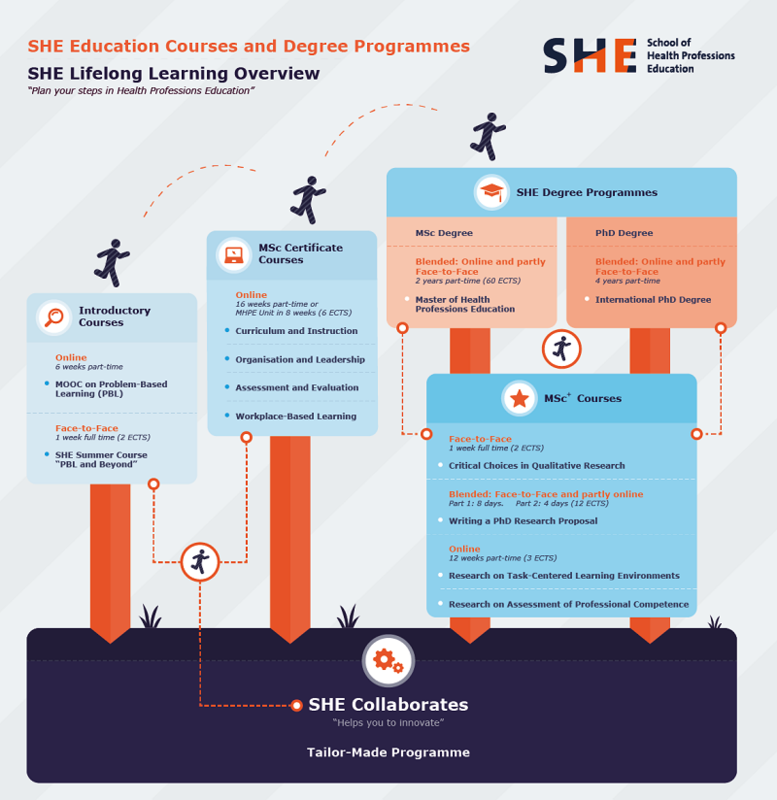 In the SHE PhD programme participants perform educational research (typically a series of empirical studies) in their own work setting, resulting in a PhD thesis and a PhD degree. SHE offers courses and degree programmes for clinicians, educators, nurses, health scientists, physiotherapists, dentistry, pharmacists, mentors, lecturers, managers, dieticians, veterinarians and speech therapists.